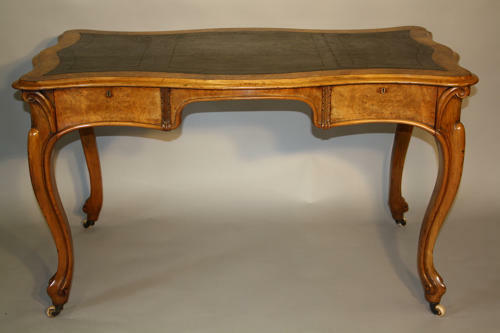 A wonderfully curvaceous and beautifully made Burr Walnut veneered Victorian desk. The double edged serpentine top has its original dark green leather top now worn and aged to a nice patina and colour. The burr walnut wood is a soft golden brown. The desk features two drawers at both the front and at the back, each with an underneath cut away arched drawer pull. Elegant cabriole legs. Beautiful and practical! English c1890.